The Aspiring Home Cook: Happy Thanksgiving!!! EDITED: The recipe is the same great recipe. I've just taken better pictures and add a video version of the recipe too. Happy Thanksgiving everybody! Its nice to take a moment to be thankful for everything in our lives. I hope you have a wonderful time with family and friends! Today, I'm going to share with you my Apple Pie recipe. It is a very basic one but it's a real favorite. Just in case you are still scrambling getting things together for your Thanksgiving dinner, I'd suggest trying this out. It comes together really fast and served with some good vanilla ice cream, its a real winner. Add a pinch of salt to the flour and mix well. Rub the cold butter cubes into the flour till it resembles wet sand or coarse bread crumbs. Adding very little cold water, bring the dough together. Do NOT work the dough too much. If you do you'll be stuck with a dense pastry, not a light, flaky, buttery one. Lightly bring the dough together and press into a disc. Wrap in cling film and refrigerate for about half an hour, during which you can prepare the filling. Add the lemon juice to the water and keep aside. Peel, quarter, core and slice the apples and add it to the lemon juice and water solution. Add the sugar and cinnamon powder and mix well. Cook till you're left with a nice stew. It should be nice and pulpy but not a mash. Be gentle while stirring. Cook till all the water evaporates. Roll it out on a lightly floured surface. Place in the in pie dish and trim the edges. Pierce the base randomly with a fork, to ensure that it doesn't puff up. Bake at 220ºC for 6 minutes. Remove from the oven and fill it up with the prepared filling. Roll out the other part of the dough and place on top of the filling to cover the pie. Seal the edges by crimping it with a fork. Using a sharp knife make a few slits on the top to let the steam escape. Brush with a little milk or beaten egg. Bake it at 220ºC for 12-15 minutes. Cool the pie, cut into wedges and serve with some vanilla ice cream. There's nothing like a good apple pie, and yours look wonderful! Thank you for sharing your recipe with the Hearth and Soul hop. 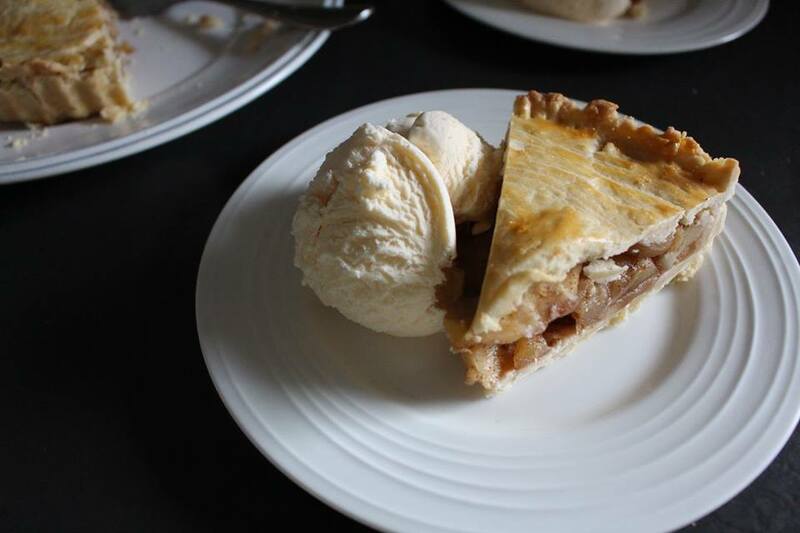 Trisha, your apple pie looks like sheer perfection! Happy Holidays, my friend across the sea! Thank you so much Jenn, Hope you had a brilliant Thanksgiving!! !